On this site you find invitation links to the best Shopping Communities. At some Shopping Clubs you can just go shopping there when you got a personal invitation of a member. The Shopping Clubs offer brandware for extrem cheap prices. The membership is free and you don‘t have any obligations! Many links in this article are invitation links. When you register for clubs such as brands4friends, ClubSale, Secret Escapes, Westwing or BrandAlley you can get a coupon for up to 15 Euros. Best Secret.com is a very exclusive Shopping Club for fashion and lifestyle. As in any other Shopping Club just members can purchase brands for extreame cheap prices. You find highest quality brands and designer articles up to 80% off. The company vente-privee.com has developed a new sales concept for online shopping. In form of an Online Shopping Club you find always changing, time limited Online Shopping Events with different brands. Just registered customers can access the sales of different brands, up to 70% off compared to the regular price. They offer products in fashion, accessories, household, high-tech, toys, sportswear and watches. At BuyVIP.com you can participate in highly discounted sales of well-known manufacturers of fashion. In time and volume restricted campagnes you can buy selected products of well known brands such as Joop, DKNY, Calvin Klein, Dior, Gucci, Prada, 7 For All Mankind or Columbia. You can save up to 70% in lifestyle and fashion. 10 € Amazon-BuyVIP-coupon: BUYVIP33 - this applies only once for the first order until 31.05.2013 for orders over 50 €. No combination with other coupons of Amazon-BuyVIP. brands4friends is a closed shopping community where you can go shopping when you got an invitation by another member. The membership at brands4friends is totally free and offers members great brands such as Dolce&Gabbana, Ed Hardy, Armani, Joop! and many other luxurious labels on sale for up to 70%. The assortment of goods changes constantly between fashion and accessories such as bags, watches, jewelry and sport articles as well as an overhang of recent collections, Off-Season products and special collections. As usual for shopping clubs the offer is timely limited and the amount of products is usually limited. So who comes first, is served first. 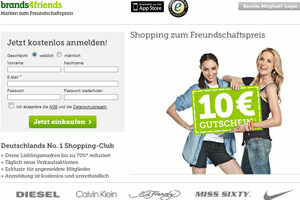 * Just new members get the 10 Euro brands4friends coupon to their account. It is valid for 30 days. Myprivateboutique.com is a new, closed shopping community for fashion, perfume, cosmetics, jewelry, watches, home and decoration. All offers by Guess, Bodum, Clarins, Lancôme, Nuxe, Hollister, Diesel, Converse, Biotherm and D&G are timely restricted and sometimes just a few hours available. In the shopping club you find a huge selection of clothes for baby and children. For example, you find clothes for your baby, which has been created by designers from different countries. They are really special because they have the patterns and designs from many different countries. You can use the baby cloth for all kind of festivities. Who doesn‘t want the baby to wear something really beautiful for a special occasion? nakiki.de also offers swimwear for kids so you can start the swimming fun for the summer! You get daily new selected products with up to 70% savings. 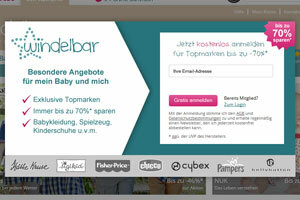 And of course, you also find diapers at nakiki.de, which is always very important for parents! 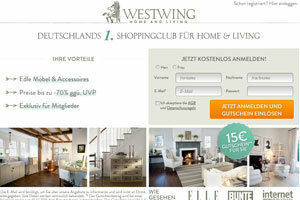 The Westwing Shopping club is Germany‘s newest shopping club for furniture, interior design and decorations. The exclusive online outlet offers several times per week at 7 am new sales for home and living at a special price. Products from international companies and interior goods of newly discovered brands are offered 70% off. The membership at westwing.de is free and without any obligations. The members of the shopping club have the possibility to buy during the timely restricted sales exclusive brands up to 70% off (compared to normal price). If you register now you get a 15 Euro Westwing coupon for new customers. You could describe the new shopping concept as online shopping 3.0. MONOQI.com is a shopping club for really fancy designer goods. The membership in the club MONOQI.com is free and without any obligations. A registered member can expect limited designer products every day from Monday till Friday. Behind MONOQI.com you find a young and international team based in the capital of Berlin. Online shopping at MONOQI.com is different because members at MONOQI.com get exclusive sales of up to 50% on the brands. MONOQI.com has revolutionized the shopping experience. The usual shopping experience is easily beaten, not just because of the handpicked products. Anyone can become a member of the MONOQI.com Shopping Club. It is free and without any obligations. 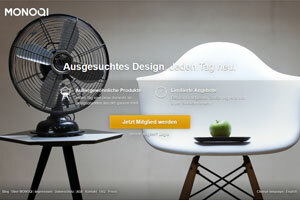 At MONOQI.com you find exclusive designers and their products in a community of design lovers. If you want to be part of that community than register today for free. Be under the spell of these beautiful every day designer objects which make you happy! 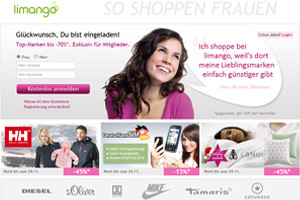 With over 2 million members Limango ranks among the quickest growing online shopping communities in Germany. Limango has new sales daily of selected brands and you can save up to 70%. With that in mind, Limango offers a good way to do some shopping for a very special price. As many closed shopping communities, Limango has no constant line of goods. The sales events are timely limited. Every day, at 7 am, Limango.de starts a new sales with designer labels in household goods, children‘s fashion, shoes, toys, layette, and baby buggies. The offer is valid while the stock lasts. For shipping per order limango and limango-outlet charge 4.95 Euros for shipping. The Zalando-Lounge is the Shopping Club of Germany‘s biggest Online Shop. The Zalando-Lounge is an exclusive online outlet where you can get original products from brands selling jewelry, fashion, watches, and accessories up to 70% off the regular price. Highest quality brands such as Emprio Armani, Versace, DKNY, Just Cavalli, Diesel, D&G, and Ed Hardy are waiting for you - well worth to stop by! All sales are timely restricted. The membership is free and without any obligations. Of course, you just get original brands selling fashion, accessories and daily changing sales with up to 70 % off. You can also return your order 100%. The delivery is in a maximum of 30 days after you have ordered your product. 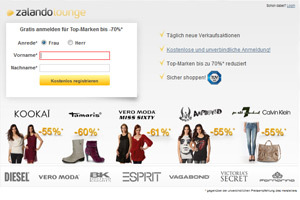 The Zalando-Lounge accepts purchase on account, Paypal, bank transfer and credit card. PrivateOutlet.com (BrandAlley) has online sales events of big brands for their members. You can save up to 80%. BrandAlley - PrivateOutlet.com offers well-known designer brands and fashion product for discounted prices just for members. The time for delivery takes between 3 and 15 days. You can see your specific delivery time after your order. All articles are new, first class and you have a 100% money back guarantee. PrivateOutlet.com is available in Germany, Spain, France, Austria, Belgium, Ireland, Italy, Luxembourg, the Netherlands, Portugal and Great Britain. Don‘t wait and register now for the private outlet community! You don‘t have any obligations and is absolutely free. Clubsale.com is the exclusive shopping club for brands in boardsports, streetwear, fashion, shoes and accessories for unbelievable discounted prices. Clubsale.de is for members only. All goods are strongly limited and you can save up to 80%. Shopping club is the magic word when you want to save money. You can enjoy highest discounts for selected users. The members-only concept of a shopping club offers individual sales for a fantastic price. SecretEscapes is such a club but you won‘t find fashion and lifestyle products of the season but worldwide offers for hotel and traveling. SecretEscapes offers top arrangements in 4-5 star hotels. 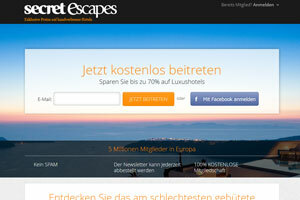 The membership at SecretEscapes is free so there is no need to hesitate to register without any obligations. All offers are just online for one week, so you have to be quick to grab them. If you love travelling you shouldn‘t hesitate to become part of this community. Just register and save lots of money! Fab.com is the shopping club for the most beautiful products in house and garden. You find daily sales of selected products of luxurious accessories for your home and highest quality designer furniture 70% discounted. You can discover well-known brands but also smaller premium manufacturers and designer, nationally and internationally. The single offers last no longer than three days and are very limited in stock. Often products are sold out quickly. So just members of Fab.com can see the campaigns. The membership at Fab.com is 100% free and without any obligations. 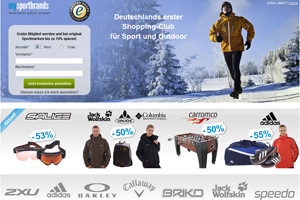 Mysportbrands.de is a closed shopping community and offers an exclusive selection of highest quality brand goods of famous outdoor manufacturers such as X-Bionic, Timberland, Jack Wolfskin, Columbia, Brubeck, Nike, Vaude, Oakley, Uvex, Mammut, Cannondale and so on. All other product and company names are trademarks of their respective owners. The percentage-wise specific price refers to the retail price (MSRP) of the manufacturer.